This might be my favorite post of all, as far as my pre-trip planning and organizing goes. I’m totally in love with my binders, so get ready for a gushing blog post about these travel binders. Recently, my sister in-law sent me several boxes of binders leftover from her grad school days. 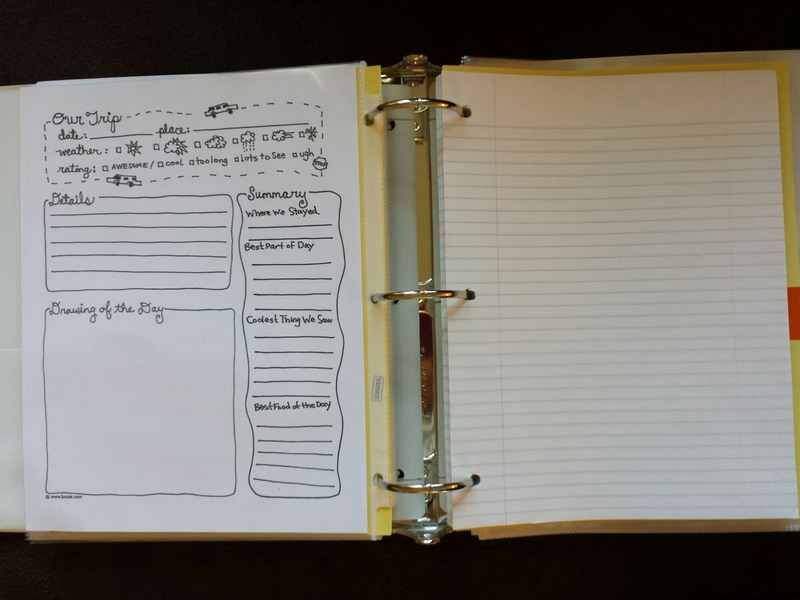 They were large, white three-ring binders and along with they came a ton of page protectors. 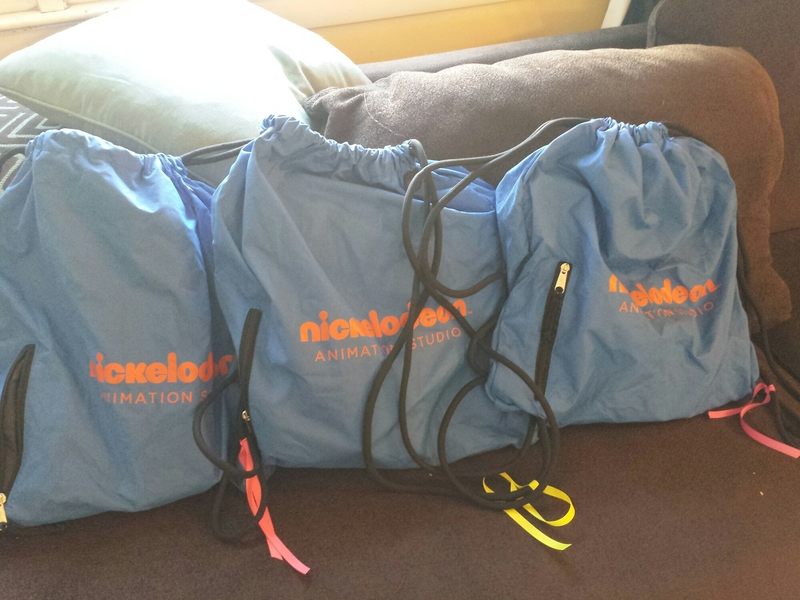 Additionally, at some point in the past year, they’d also sent us five Nickelodeon drawstring backpacks that were much better quality than the normal nylon ones we often receive from places and events. As soon as the backpacks came, I hid them in my closet, for months and months. When the binders came, I pulled out one three inch binder for my own trip organizing (I’ll tell you about mine a different post) and three other large ones for each of the kids which also went into my closet for hiding. An idea had been forming in my mind for a while, as I’d gone looking for travel journals but not found exactly what I was envisioning in my head. 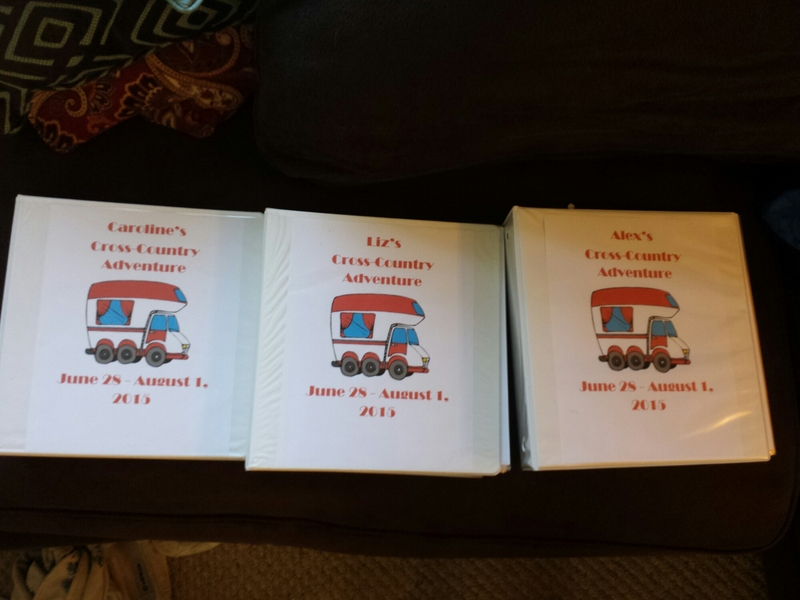 I always say that teaching never leaves you, and what was forming in my head was the absolute best cross-country adventure thematic unit ever for my three kids. I wanted something that was part travel journal, part learning activities and part passing the time activities. I started looking online on blogs and on Pinterest and sure enough, many people had the same ideas and were sharing their resources very willingly, for which I am incredibly grateful. Many of these pages shown were created by me, but more than what I created, were the ones shared by others online. I started a Kid Binder folder on my desktop and each time I found something, I’d put it in the folder to be printed before the trip. I started to type up cute section dividers for each section. 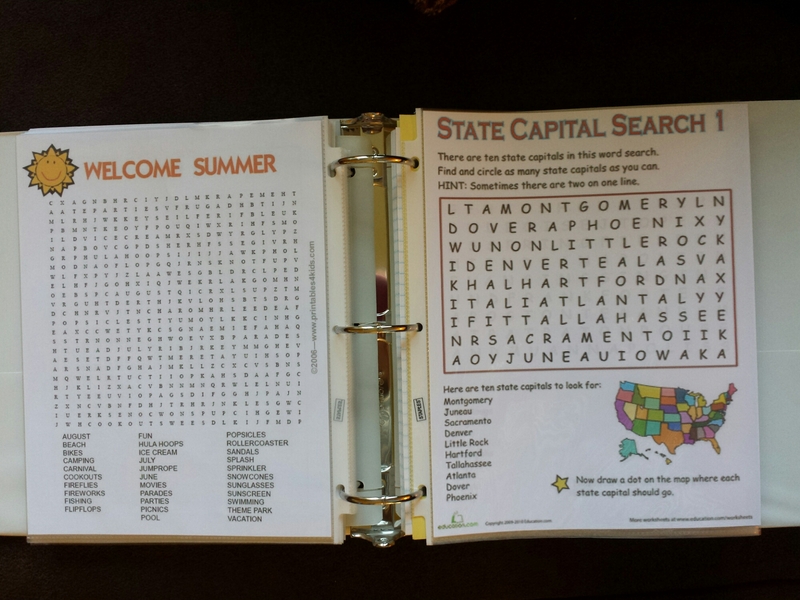 US States and Capitals: I have maps for filling in where we’ve gone and the dates when we are there, cross word puzzles, word searches, and information about states, capitals and state flags. For them to keep track of landmarks they’ve seen. Things you might not see again or have seen before: I have information in there about geography terms for the various parts of the country, a place to track the temperatures since they’d be seeing a vast difference as we traveled east to west and back again, and information about types of rocks since I knew they’d be seeing types of rocks we don’t find at home. They also later decided to keep one rock per place we stay and label them with a sharpie marker so that will be a pretty tangible example of the differences in the rocks they’re seeing on this trip. 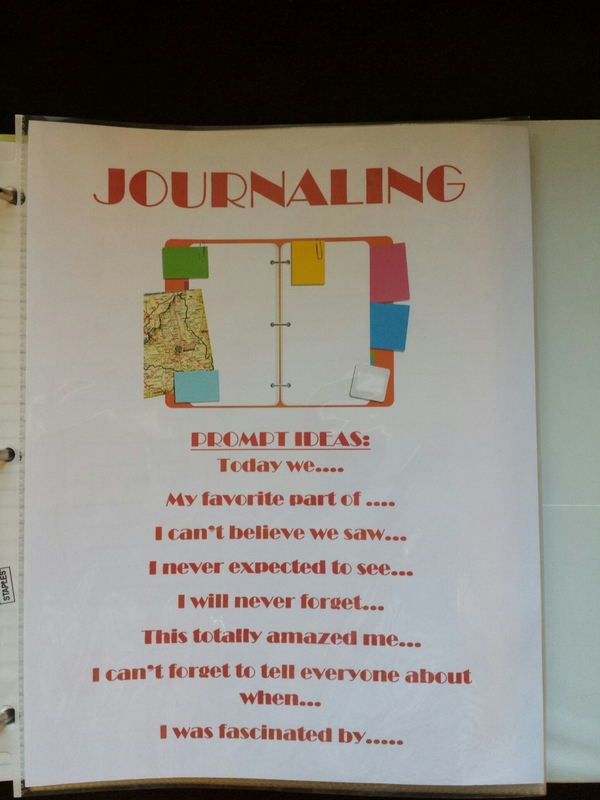 Journaling: I gave each kid an entire pack of loose leaf paper and I did a list of journaling prompts in case they were stumped on what to write, but I also gave them an entire one-page graphic organizer for a journaling page in case they just wanted to follow that. They could do either format, or a combination of both, whatever worked for them, as long as they journaled. 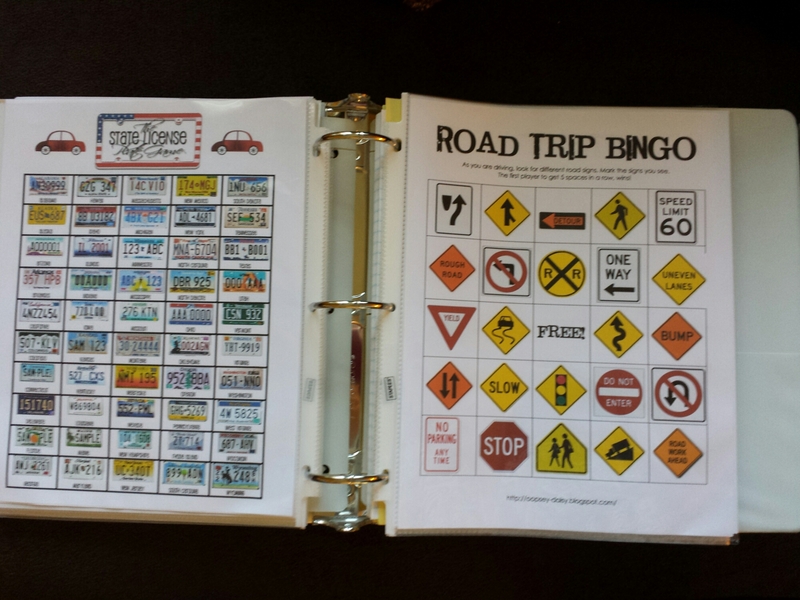 Bored games: I put in grids for Tic Tac Toe, I had BINGO games and I spy games of all sorts from spying colors of cars, brands of cars, state license plates, restaurant logos, street signs and more. I put in five pages of “learn to draw” pages and some blank white paper. 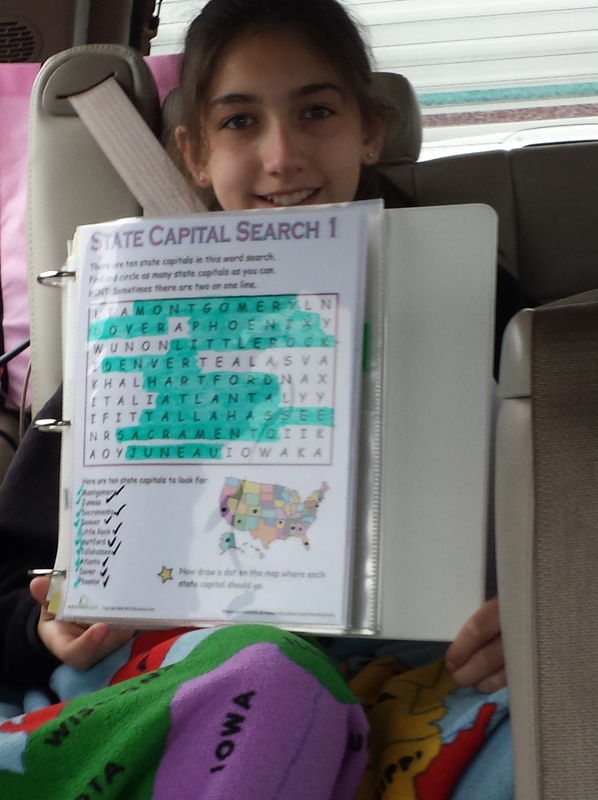 There were several scavenger hunts, including one from my cousin that she received at a campground which you do when you arrive at a campground. Again, all these things could be done over and over again with the dry erase markers by using them inside the page protectors. 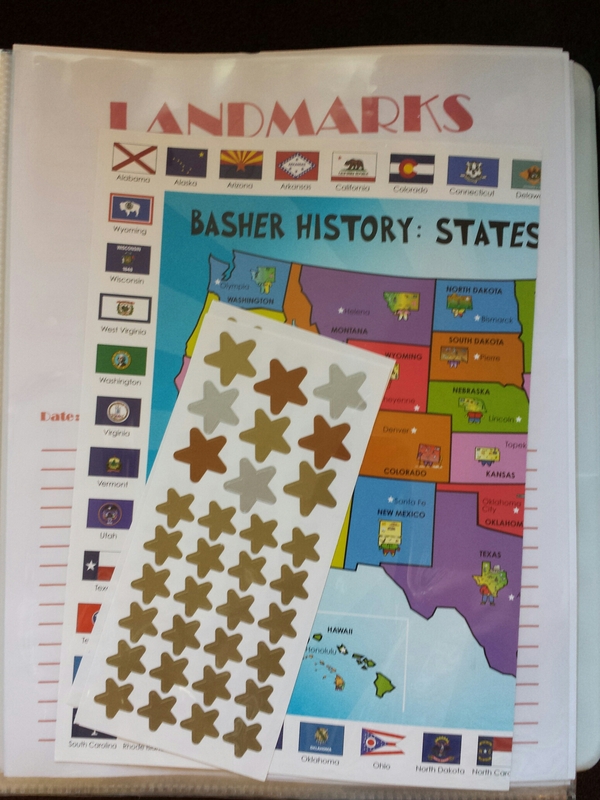 Empty page protectors: I wanted them to be able to slide in anything they wanted to save, whether it was maps of areas we visited, a restaurant menu or a ticket to something so I gave every kid 10 empty page protectors. Photo pages: I bought everyone a pack of 4×6 photo pages that came to sections per page so that they could get postcards and slide them into the slots. These binders were the best kept secret I think I’ve ever kept for so long. I could not wait to put them together and to give them to the kids. I printed them out just before we left, and assembled them on a night they were sleeping at my mom and dad’s house, since it took some time and I needed some space to spread them out and assemble them. I put them into the backpacks and tied their favorite color ribbon on their backpacks (which coordinated with other things I’d tied their favorite color ribbons on for this trip) since all the packs were the same and we’d need to be able to tell at a glance whose was whose. On the day before we were leaving (which actually ended up to be the night we left) I brought all the bags out to the camper and watched as they opened them. They were so excited to see them. I’d been seeing them all along so I knew how great they were, but they were seeing them for the first time with fresh eyes and excitement, and they loved them. 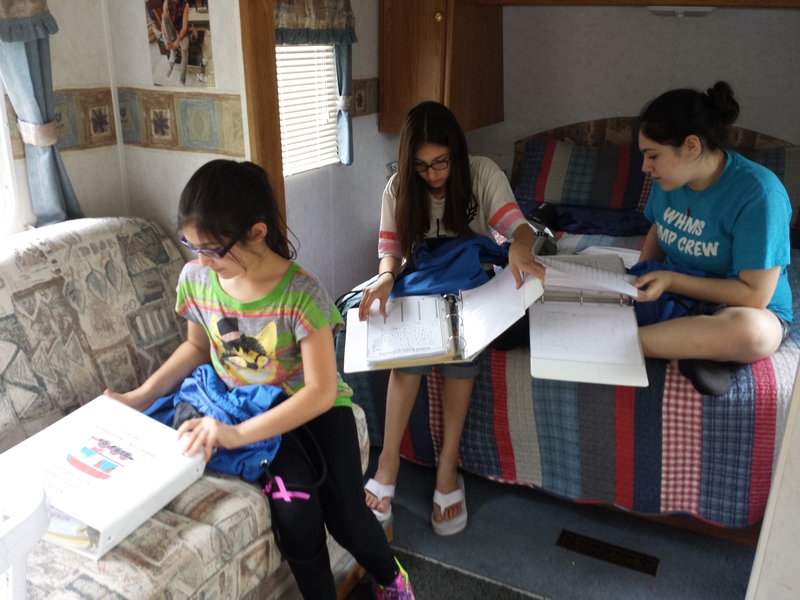 My oldest daughter said, “You’re the best, Mom, no one else would do this for us!” That made me so happy, and although I know that’s not true, because the resources I got were all shared from other moms who’d done just that, it made me feel good that they realized how great their binders were. It made me proud in the coming weeks as they showed them off to people and it made me excited when they used them during the trip. I know that they can save them forever and show their kids this amazing adventure. They can look back on this trip and all they did, saw and learned, for years and years to come. For me, that’s priceless, that’s the best gift I could give them. Below is a list of websites and blogs that I explored when putting my binders together. I tried to remember to list them all as I went along, and hopefully I did not forget anyone. I always like to give credit when I’ve borrowed something from someone else. Thank you to everyone who so willingly shared their creations with us! Although I may not have used every single thing below in my binders, everyone provided me with ideas and inspiration. If by chance I did forget to credit someone, please leave a note in the comments with the link to your blog or site so I can thank you properly! Great post! I love those binders!